This is the best of the best on the Arkansas River. Royal Gorge Anglers maintains a number of large private leases on the Arkansas River, all of which fall within the 102 mile Gold Medal section. The Full Day will cover a ton of water within one of these private sections, and our guides will focus on not only getting you into a lot of fish, but instructing the in's and out's of this great river! ***Lunch and refreshments are included in all Full Day trip formats. Experience the best water on the Arkansas River in a short session format. 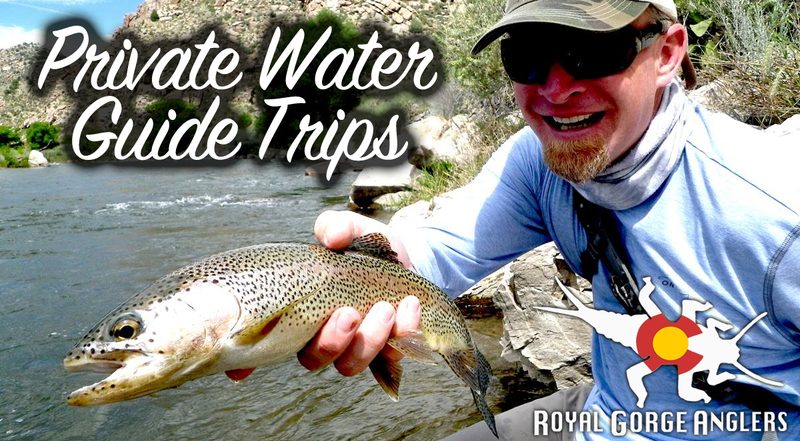 The half day private water guided fly fishing trip with Royal Gorge Anglers will get you into quality fish quickly. If you're time is limited, but you want to experience the best scenery, solitude, and fish on North America's longest Gold Medal trout river...this is the trip for you! **Full Day trips include Lunch and Refreshments. The night of your guided trip, we will put you up at a private 400 sq. foot guest house a stones throw from the lake. This quaint yet comfortably appointed guest cabin offers a king bed and room for an air mattress, full bath, and cable tv. The major plus of the overnight option is that one FREE private water rod fee (Reg Price $75) is included in the pricing! ***Dinner and Breakfast Meal packages are optional, and provided by the property owner who is a certified chef. Please see add-ons at a later step in the booking process for menu and pricing options.